If you're looking for a simple and highly effective natural tool to melt away emotional stress, I highly recommend that you give EarthRain a try. 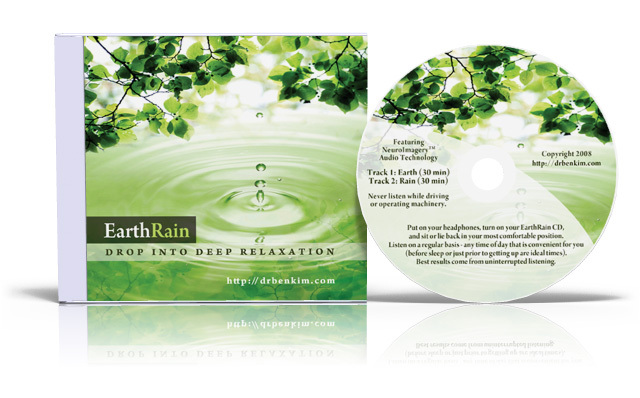 EarthRain is an audio CD that combines peaceful music, quiet rainfall, and other comforting sounds of nature, all layered together with groundbreaking vibrational technology that promotes deep relaxation, emotional balance, and calm. High blood pressure is often called "the silent killer," as it can cause harm in your body without your awareness. My feeling has long been that emotional stress and anxiety are even more prominent silent killers because they cause your autonomic nervous system to constantly be in fight-flight mode, even when you're sleeping. Being in fight-flight mode is helpful to your survival if you happen to be staring down a grizzly bear up on a mountain, but if you're not in physical danger and don't need your heart, lungs, and skeletal muscles to be primed for you to fight or run away, having your autonomic nervous system ratcheted up several notches is guaranteed to cause premature disease in your body. In fact, through my years of experience as a health care provider, I've come to believe that no other factor has greater impact on your health than your emotional health status. I first became aware of the benefits of engaging in regular relaxation sessions when I moved out to the San Francisco Bay Area after graduating from chiropractic school. I was tens of thousands of dollars in debt, working as an exam doctor while I waited for my chiropractic license, and feeling somewhat lost and lonely trying to establish myself 3,000 miles away from my home and family. What kept me grounded and motivated to make the most of my situation during that stressful and lonesome time was a little book that I ran across at a local bookstore that described the powerful health benefits of relaxation and visualization sessions. I remember being impressed with the idea that we can dramatically improve our health and promote feelings of emotional balance and calm by spending some time each day doing nothing but relaxing body and mind. I was also intrigued by the idea that we can create positive change in any area of our lives by regularly visualizing what we wish to see. After reading that book, I spent almost every evening after work at the Berkeley Marina, a magical little park located on the eastern shore of the San Francisco Bay. There, while I looked out at the city of San Francisco, the Golden Gate Bridge, and the most beautiful sunsets you can imagine, I gave my mind and body the opportunity to be completely quiet and free. When my mind would drift to random thoughts, I would return my attention to the tide and wind, or the warmth of the sunset on my face. Sometimes, I would visualize in vivid detail the life that I wanted to live. I'm grateful that I started regular relaxation and visualization sessions at that point in my life. I truly believe that this practice, one that I continue today, has given me the foundation of emotional strength and balance that I've needed to do everything that I have personally and professionally over the past several years. After leaving the San Francisco Bay Area, I continued practicing deep relaxation and visualization with the help of special audio CDs designed to facilitate optimal relaxation and inner harmony. Of all the CDs I have tried, EarthRain is the only one that has allowed me to feel the way I did at the Berkeley Marina. Today, whenever I feel my shoulders start to tighten or my breathing become shallow, I put on my headphones, lie down in my office, and let EarthRain relax my nervous system. Doing this always leaves me feeling like I just did something good for my health - that I've just improved my health in a measurable way and even extended my lifespan some. What makes EarthRain so powerful as an all-natural relaxation aid is the groundbreaking audio technology that's layered underneath the soothing music and sounds of nature found on both tracks. All together, there are six layers of "vibrational entrainment technology" weaved into EarthRain. As you listen to EarthRain, the vibrational layers generate theta and delta waves in your brain - these are brainwaves that are associated with deep relaxation and a relaxed autonomic nervous system. Though you won't hear the vibrational layers, if you have advanced sound analysis software, you can see all six of them playing concurrently with the soothing music and sounds of nature. It is the absolute best relaxation CD I've ever heard. When I put it in my portable CD player and put my earphones on, it immediately transports me back to my childhood, on a summer evening as I would lay in bed beneath the open window listening to the birds and the rain, and all nature had to offer. It is so wonderfully relaxing, and satisfying, and peaceful. I am SO glad I have it. I just can't listen to it enough. First what I noticed right away was that my breathing became much deeper, a deep breathing from the belly. I found that great because most of the people me included breathe far too shallow. The second effect was/is that when I meditate I get very soon in a deep state of "absence" or profound relaxation, my daily meditation is much more profound. When I am a little bit stressed out at the office I use the CD during my breaks. It is wonderful even if it is for only 10 or 15 minutes. Thank you very much for that great music. 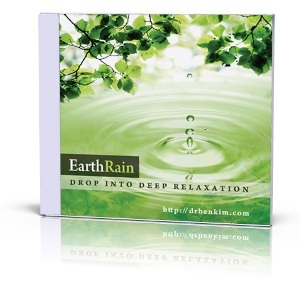 I have been meditating using your EarthRain CD for a couple of weeks now and find it to be the best meditation CD I have used so far. I very quickly descend into a deep Delta state and find that the more I use the CD, the quicker this result is achieved. I find that I cannot lie down while meditating with your CD (my preferred posture) or I will fall asleep, something that was impossible in the past while tuned into any kind of musical device. I also enjoy your newsletter, EarthRain Meditations, and look forward to each new issue. I have learned many interesting things, and my meditating has improved because of your advice. Thank you. I look forward to many hours of powerful meditation. Bottom line: if you're looking for a highly effective natural tool to promote emotional balance and calm in your life, and to improve your overall health in the short and long term, I highly recommend that you give EarthRain a try. Please note: EarthRain is a sixty-minute CD (two 30-minute tracks) that is most effective when you listen to it with a good pair of headphones.